I was recently asked to demonstrate how I went about doing a provisional cast-on. I have 2 methods, both using a simple crochet chain, and, truth be told, they amount to pretty much the same thing. 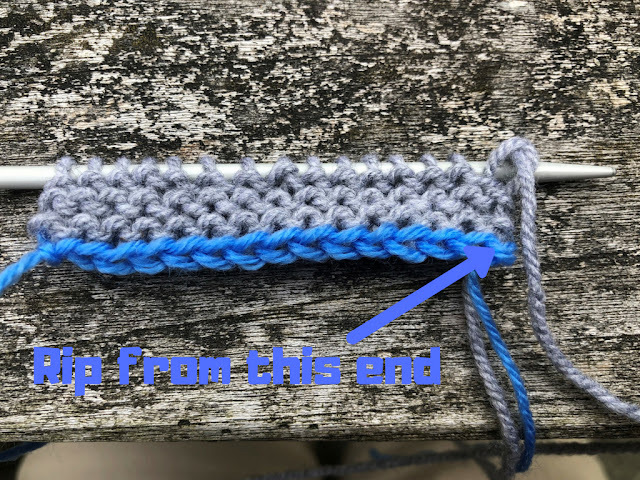 The cast-on in crochet is essentially a disposable beginning, which in both cases can be ripped back to expose a second line of live stitches so that you can do a knit-down finishing or some other join in your knitting. Work a single chain of crochet stitches. Make as many chains as the number of stitches that you're planning to cast on. All you do is knit into each one of those back-bar dashes, creating a knit stitch into the reverse side of the chain as you go. When you've got all the stitches cast on, just carry on knitting as normal. And when you're done and you want to come back to the beginning to create another working edge, you simply unravel the crochet chain, and pick up the stitches from the unravel as you go. You're now good to carry on working in the opposite direction. For the first pick up row as you unravel it makes sense to use a finer needle so that you keep your tension even along the row. Remember that crochet is like knitting, you must unravel it from the cast-off end backwards. It will not unravel in the direction that it has been worked. For this reason you need to remember where you originally cast on with your crochet chain. It's a good idea to tie a very obvious, ugly-looking knot at the end of the chain so that you know you have to rip the chain from this end. 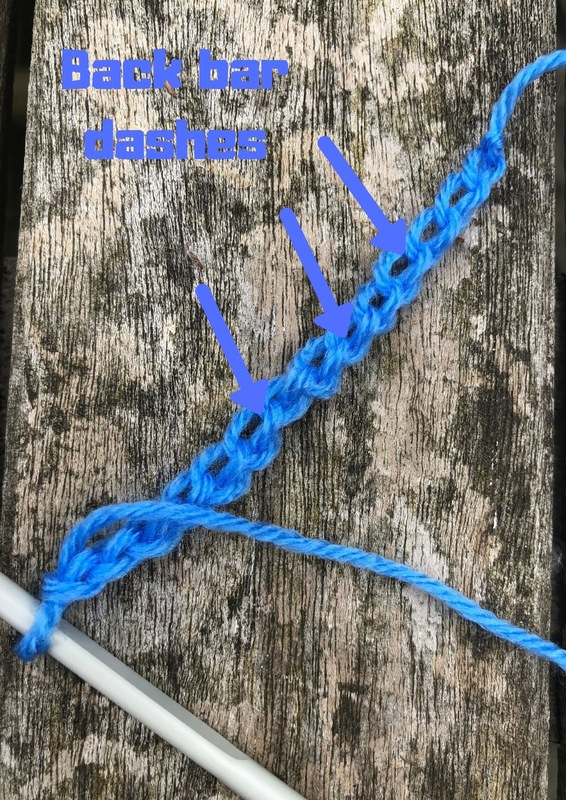 This involves creating a crochet chain with the knitting needle in the centre of each crochet stitch. It's another way to the same result as Method 1. 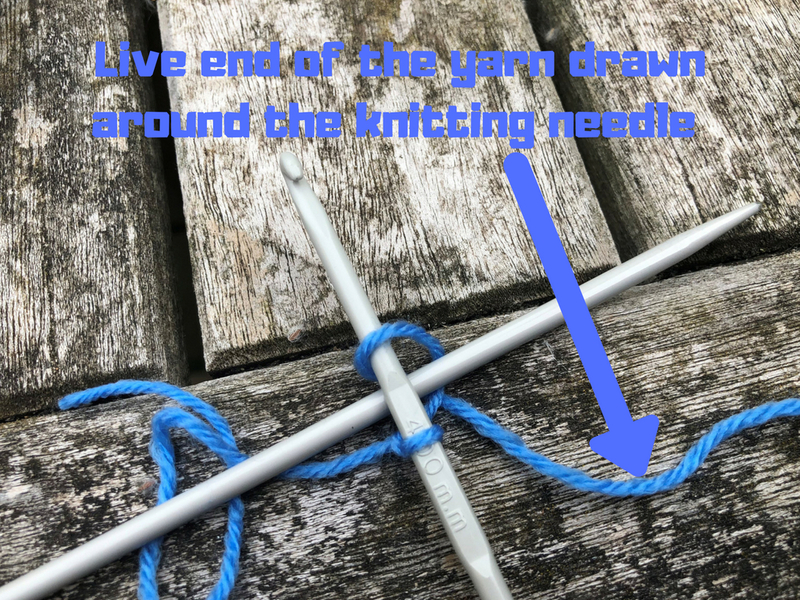 Draw the loop through from the other side of the needle through the loop on the crochet hook to chain the stitch with the knitting needle enclosed within the crochet chain. Keep going, drawing the wool down and under the knitting needle each time until you have one stitch less than the requisite number of stitches. Then hook the last stitch on the crochet hook onto your knitting needle to form the last stitch of your knitting row. When you've got all the stitches that you need on your knitting needle, cut off the cast-on wool, join your main colour wool and carry on knitting as normal. It will look exactly like the sample produced following method 1 above. In this case you will be able to identify the end of the original crochet chain for the purposes of ripping back in the opposite direction because there will be a strand of cut-off cast-on wool and the cast-on strand of the main colour at that end. And so method 2 takes you to pretty much the same place as Method 1.